I had the belts ,alternator belt and fan belt, replaced a month ago. He told me during this visit the belts needed replacing.I authorized it, although I was not aware of any problem. When I came back, he showed me the old frayed belt. The replacement belts look indeed brand new. The next morning, when I started the car, there was a singing noise were the belts on the front left side, when I started the car , meaning, pushing down the gas pedal upon start up. It is at its worst when accelerating. At first, after a short time of driving, the singing would stop.. Since some time now this noise turned more into a loud loud squealing ( scary) ,and its definitely worse when it is colder in the morning. Now frequently at the squealing noise continues for quite a while while I am driving. I am afraid to go anywhere with the car, I am thinking the belt may rip, or something. Does anyone have an idea what this could be? This a new belt. Is the belt too tight? Or could there be something else wrong ? I feel very definite about the fact that this started right after the replacement of belts. I had no problem with belt before. This present mechanic apparently does not take responsibility for any work, as I have learned now .I like to go to a different mechanic . First off what is this thing? Model, year, engine at least? Note while here: Serpentine belts really don't fray so much rather cracks show up with time and age. Fraying suggests pulley are not in line or proper position somehow? It's possible to not get the correct # of grooves in certain models with serpentine belts. Some cheap or not cheap belts really stink for noise and can sound like an engine is having a serious problem. Dayco is a brand that tends to be quiet for me for longer and states so on packaging. If this is old enough or uses "V" belts or maybe just one is you have to say so. My car is a 1993 Toyota Tercel DX with 120 000 miles. I think this car has a 4 cylinder engine. Anyway, I had seen nothing wrong with the old alternator belt before, I had no problem with belts. But I trust that this old alternator belt, he showed to me, was not good anymore. What I gather from your response is, it could be several things: a cheap belt, or a belt that is not properly mounted on the pulley. I do not know what a "V" belts is but I looked it up, and I think the 93 Toyota Tercel has a serpentine belt . I think the other belt right next to to the serpentine which was also replaced was the water pump belt. The mechanic said they are always replaced together. Is there anyway, I could check if the tension is too high? Or identify a cheap belt.Can I see if it not properly mounted as a non-mechanic? Words in English are somewhat interchangeable and differ by location which one or ones are used by area and if well known people try to know all possible definitions in context of what was meant. Frayed would be a common term/word for a belt that is worn just not the first way to identify time to replace the serpentine type of belt. More often you might say, cracked, glazed (it might shine) or known old from last time it was replaced. I couldn't look up all possible accessory belt options for this car as apparently it was available without power steering and without air conditioning either or both would change which belt would be used by size not the basics. You measure the tension of a belt with a tool or many will have done so many you meaning the mechanic just has a strong idea of how tight to leave a new one in this case is manually adjusted (a strong guess for this car) so leave it a little bit tight when new expecting it to stretch or break in (wear in) some then be exactly right. Alone only too loose would screech usually upon start up and probably go away but indicates it needs checking for tension again which is supposed to be done every 15,000 miles or so for manually tensioned belts versus automatically tensioned belts of any type. The belt the runs the alternator should also run your power steering if equipped and or air conditioner compressor on this car. Some may use a second belt or even a third. There's yet another belt and not sure which one you mean. It's called a timing belt that also runs the water pump and is self tensioned in this car by springs you replace when it is done but may not replace everything. You do need to know which one(s) were replaced. I can't take you thru years of training and experience to explain every possible reason a belt or more could make a noise from scratch (the beginning) as that's a two year program and more years of on the job experience. To put this to a quick test of belt(s) you know are just replaced you can just mist them but make them wet with plain water and a spray bottle with engine off then start it up it may be quiet for a short while which suggests belt is the cause of the noise new or not. If a belt is installed incorrectly most would fail quickly up to shredding the rubber and quickly falling right off the pulley system it was on. So you notice this noise instantly when belt that now I'm not sure which one or ones were replaced and you said you don't trust the mechanics you know? Is that their ability to do proper work or do you think work is being done that didn't need doing at all? About some brands of belts: Some just make more noise than others up to being so objectionable even new your choice is just to replace that brand with another or back to a Toyota marked belt if in fact they made any of their own belts - many car makers do not the common parts to their own cars when they were new. What should prevail is that YOU are the customer here not really expected to be the expert on any of this rather the mechanic is supposed to. If this makes this noise and is safe enough to drive in your common sense opinion it does become up to you to find the right mechanic that can diagnose it. Thank you for this great explanation! There are only two belts visibly on the passenger side , sort of parallel the alternator belt being more in the front , the other smaller .and more to then back, maybe its a fan belt , he said something about air conditioning? The timing belt ,I know for sure was not replaced, does not need to be done until further 30K miles and is difficult to put in . No, I do not have power steering, so the alternator belt belt does not run that..
And yes, your term “screeching” is the better description of the noise, that is why I need to fix it. Today I looked at my belts , the alternator belt seems to fit on the pulley and its quite tight. The alternator belt the mechanic put in is indeed a V Belt I think: Why? Bando Rib Ace Precision Engineered V-Ribbed Belt Part #: 4PK920. Unfortunately, I also realize now, after this research , my belts do not cost 60$ each. I will try your suggestion and then hopefully follow up with a better mechanic to take a look at the belt. Thank you for your great effort to help me . OK, I think? The belt style is NOT interchangeable at all so forget that. "V" is just one "V" the other type would have smaller and more but must match pulleys. Said and quite rare for the wrong # of grooves wouldn't last an hour probably. You are having trouble with the mechanic or shop that put them on - right? It's still their responsibility to take care of it. In the future ask for old parts back so you can visually match them up and count if somehow there was a mistake. What I really think happened is that these (any brand can be an unknown) were OK for a very short time where they were first set for tension = how tight. With non self adjusting belts there's a pretty quick stretch and break-in time so it's an educated guess to purposely put on just a bit tight when new that it will stay perfect in seriously - just a short run time or some as quick as 10 miles or so. It's a judgment call for the mechanic OR they ask you to stop by the next day or two and set it for a real long time. A belt too loose will screech and usually quit it. What that is, is upon start up the battery worked some and when running it quickly works hard to put back the power just lost from cranking the engine to start. That and or if you run lots of electrical items it's working harder (alternator) which is a load on the belt and slips - hence the noise and it's not good to leave it that way you would then just snug it/them up properly. They just don't sell belts pre stretched that I know of so it's a game of some know how. FYI - Calling a belt a "fan" belt is just a name. You car doesn't run the fan by belt but it could still be called that - just forget that for a name it's an accessory belt. What do you want to do now as I'm about sure it's just too loose one or both but alternator making the noise. It's near impossible but simple to quick readjust it or both if the design I think it is. The nasty with that type of adjustment - a threaded rod goes thru a threaded hole held by nut to stay permanent is a real pest is all rusty. If it broke you shouldn't have been given the car back till that was taken care of at extra cost listed on the bill. Another FYI - the cost of parts is marked up to you the end consumer and the shop is your supplier. The markup price is theirs and they take responsibility for the parts used because of that and is also part of the profits of automotive work. Think - if you brought your own food to a restaurant and complained how it was how or why should they be responsible for it? I'm not here to pass judgment on the person that did the work but you said this started right away and stuff does happen and they really should take care of it without a fuss. Why any fuss is beyond me - this is common work some belts are just harder to get at to adjust but that's their problem NOT yours. If no luck it's on you to just adjust it elsewhere. Hey - I'm guessing this is it. Have to. It happens and not uncommon to me. Some when I know the person/customer real well don't overtighten belts but ask to stop by the next day if I know the schedule folks have and would retighten again while a person waits then it's done for good without a risk of way overtightening a belt which isn't good for the items it runs. Sorry for the novel. I just can't say all this in two lines. That would be a 4 rib serpentine belt that is 92 inches long. It should be mounted with a spring loaded automatic tensioner. Well, thanks for this great education. I guess, I will bring the car one last time to this particular mechanic, and have him take look at the tension. My fear is, he will tell me something else is wrong, alternator, or so. Well, we will see. From all you explained to me , I think, its the tension, too loose ,or too tight. No rust on the car, I do not live in a cold climate. However, for the future, I will try to find a mechanic, who does not view any slight comment or remark on his work as personal criticism and just be completely upset..
You would be a lot smarter not to comment on him at all, especially if you don't have the knowledge to back up what you are saying. I think you are not looking at the belt being the issue. I would expect the noise is coming from one of the components that the belt drives. The tension on those belts are manually adjusted. There are two belts: AC and water pump/alternator. If a belt(s) is too tight it can sing or cause what it is driving sing. It will also put a lot of pressure on accessories and front crankshaft bearings leading to failure if they are over tensioned. If a belt is too loose, the belt will slip and squeal. 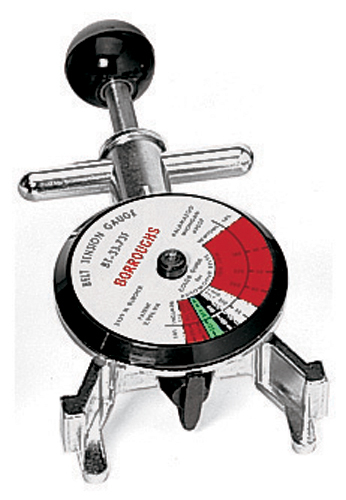 There is a tool to adjust the tension on those belts that is rarely used most of the time. If your mechanic replaced all those belts, $60 is reasonable. These are the specs for the belts when they are new. Common type of belt tension gauge: There are many types.